Success can be yours with Kevin Trudeau's Mega Memory learn to use your entire memory today! The world's foremost producer of personal development and motivational audio programs now presents the only tool you need to release the perfect photographic memory you already have. Using the latest breakthroughs in memory training, Kevin Trudeau, founder of the American Memory Institute, has developed a complete, step-by-step program to give you access to allthe hard-to-reach information in your mind. Join the leaque of business professional, students and people from all walks of life who benefit from having instant recall memory. A photographic memory is within you. Mega Memory will release it and put you at the controls. 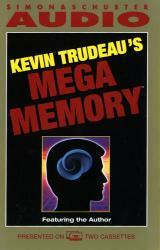 Kevin Trudeau's Mega Memory Program is the first memory program I used. I have been exposed to many memory programs and this I have to say is one of the better ones. The ideas put across in these tapes are simple yet they have signifcant effects on improving your memory. There are many training sessions at the start of the tapes which makes you wonder where is the application part. However, as the lessons progress, you will realised when and where you can apply your new found skills and techniques, boosting your confidence tremendously. Seriously, if you desired to have a better memory, I strongly encouraged you to get a copy of this program and start taking MASSIVE ACTION to turn your desire into reality. Why 4 stars you wonder? It does not have the advanced memory system for remembering numbers, its found in his book though.